We know what a cuddle can do to elevate a mood, but it turns out a snuggling dog has important advantages over the more aloof. A dog that understands the comfort and security of being physically close to her owner will be more relaxed when touched by groomers, veterinarians, pet sitters or the neighbor next door -- and will understand that there's a time for activity and a time to be calm. Cuddling is also a great way to socialize your pup and to celebrate the special bond you share. There are many ways to cuddle with a small pooch. Some dogs like to lick or sniff their owners' faces; others want a belly rub or to lie in a lap or even snuggle behind their owners' knees on a bed. - Classical or Pavlovian conditioning: This training technique helps create positive associations between behaviors and outcomes. For example, whenever you touch or pick up your dog, reward him with a "high value" food like a juicy piece of chicken or steak. He will begin to associate touching with the good feelings of a special treat. Over time the rewards will not always be necessary to get a cuddle. - Reward spontaneity: It might be easy to miss, but you know those special moments when your dog gets the attacks of the snuggles and unexpectedly hops into your lap, if only for an instant. This is a good time to reward your developing cuddler with treats or a fun game. - Make it fun: A soothing massage, a gentle ear stroke or a tummy rub may be the only motivation your dog needs to find your lap the best place to spend an afternoon. Even with these tips, it's key to remember dogs have likes and dislikes just like people, so pay attention to your small dog's behavior. Does he struggle to get loose or does he kiss your face and attempt to sit in your lap? You can train or condition your dog to enjoy cuddling, if you work at a pace that's comfortable for him. Are Small Dogs Always Alpha? Are small dogs more trainable than large dogs? 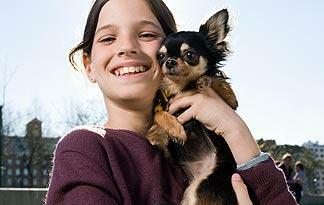 Are Small Dogs More Prone to Joint Issues?